The Ensemble "La Variazione" offers transcriptions and variations on Opera themes, symphonic music, camera works, Musical and Operetta, and traditional themes re-elaborated by the members of the Ensemble. The members of the Ensemble are well-known soloists who often "vary" in number and training: voice, flute and harp; flute quitet; voice ensemble, flute and string, piano. The Ensemble "La Variazione" propose music and dance performance, collaborating with professional dancers, following the same principles of interpretation and execution. The Ensemble "La Variazione" has worked with many Associations, like Amici del Teatro Sociale di Como, Amici della Lirica G. Masini di Livorno, Amici del Loggione ed Associazione del Synthagma di Milano. The Ensemble "La Variazione" has appeared on the main Italian stages, like Palazzo Mocenigo in Venice, Ridotto del Teatro di Cagli, Palazzo Trecchi and Palazzo Cittanova in Cremona, Palazzo Zanetti Cavalcab� e Tetro Accademico del Bibiena in Mantua, Basilica S. Maria della Passione in Milan, Teatro Ferrari a S. Marcello in Ancona Basilica S. Maria Assunta in Torcello (Venice) for the "Festival Galuppi". 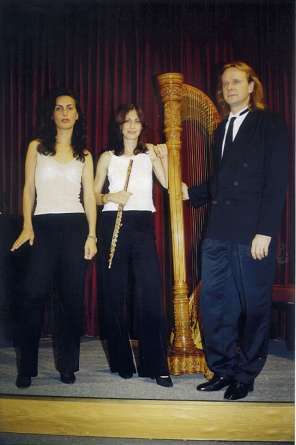 In August 2000 Ensmble played in Gressoney Festival and in May 2002 for the "Festival Organi Antichi" in Bologna. The Ensemble "La Variazione" made concerts in Switzerland, and made name of itself in Japan, appearning in tour in Tokyo and other important towns, achieving success of pubblic and critics. The flutes of the Ensemble have recorded for the German record company Bayer Records.